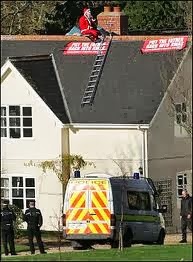 A man who climbed 120 feet (36 metres) to the top of a crane in Exeter is entering the third day of his protest. Jolly Stanesby, who is a member of a pressure group, Fathers 4 Justice, which speaks for men who say they are being denied access to their children, climbed the crane at the site of the new Crown Court at about 0700 BST on Wednesday. Mr Stanesby said he will stay there for a week, but has enough provisions for longer. Speaking to the BBC from a mobile phone in the crane's cab, he said he was a registered child-minder with no criminal record and that he only sees his daughter for two hours once a fortnight. He said: "I just want to be able to share my daughter's life. There's no reason why I shouldn't." Fathers 4 Justice said it endorsed Mr Stanesby's actions. Contractors at the construction site said security was adequate and they could not explain how Mr Stanesby managed to climb to the top of the gantry. Police are negotiating with him to bring him down and said they will review the case to see if any criminal offences are being committed. Police negotiators in Devon are trying to persuade a protester to come down from the top of a 120-feet high crane at a building site. 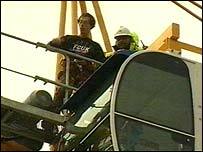 At about 0700 BST on Wednesday the man from Plymouth climbed to the top of the crane at the site of the new Crown Court in Exeter. He is from a pressure group, Fathers 4 Justice, which campaigns for contact rights for fathers and he is threatening to stay on the crane for a week. A crane driver is also in the cab and the machinery has been disabled. Speaking to the BBC from a mobile phone in the crane's cab he said, despite being a registered child-minder with no criminal record, he only sees his daughter for two hours once a fortnight. "I just want to be able to share my daughter's life," he said. "There's no reason why I shouldn't. "My daughter wants to be with me, and there's no reason why I shouldn't be able to have good contact with my daughter and in many cases it's the same." PC Roy Adams said police will review the case to see if any criminal offences are being committed. "The fact is that he has entered the building site as a trespasser and that's where any offence occurs," he said. "Trespassing itself is not a matter which the police can take any action on." Matthew O'Connor from Fathers 4 Justice says the protestor's food supplies could last longer than a week. "That is not to say he could probably last for a month if he wants to," said Mr O'Connor. "This is a well-organised, well-planned event by him. "Fathers 4 Justice endorses this type of action, particularly direct action against family courts."